The final weekend of July brought crisp, autumn-like temperatures and clear blue skies to much of the midwest, perfect conditions for outdoor activities. B.I.T. athletes welcomed Mother Nature’s respite by garnering several top placings at various venues throughout the region. Deb DuBois and daughter, Helen, competed in the ‘They Call Me Al’ St. Alphonso’s Church 5K run in Zionsville Saturday morning. The mostly flat course was toughened up by a stiff headwind in the final mile of the race. Helen cruised the event, finishing as 3rd overall female. Deb met her time goal and placed 3rd in her age group. Well done, ladies. Jim Creamer competed in the National Senior Games in Cleveland over the weekend. Unlike other parts of the midwest, Cleveland featured rain and cool temps as Jim reports, “Although this was a national race, competition was closer to a local Masters 50+ event that was won by a ‘Boggs’ type racer from Mississippi who won both days (he also won both TT events). I think Indiana is quite strong comparatively. “Saturday was cold and very wet. Not knowing anyone, I went with every early break only to be brought back. 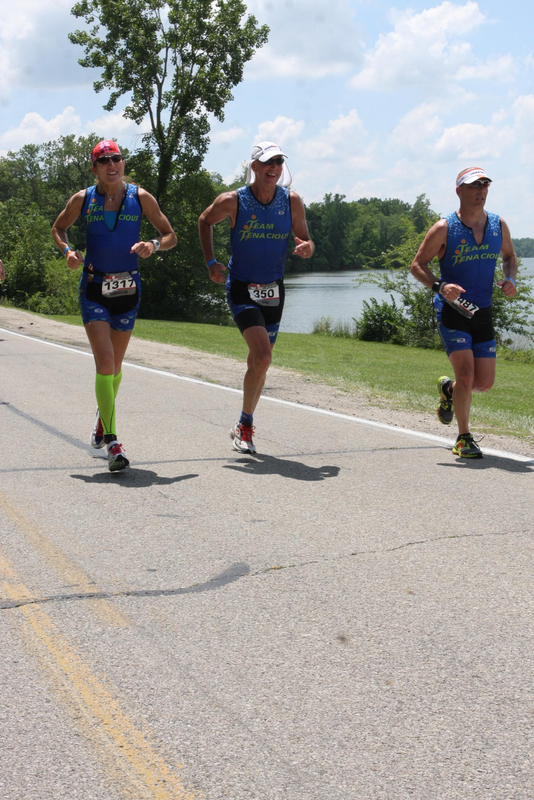 The course was on a highway along lake Erie that had a climb of nearly a mile. 1st lap was in the big chain but later laps I spun up the hill in the small. The field split quickly on the 2nd lap following a series of attacks when the eventual winner broke solo midway up the hill. No one gave chase and I for one, was beginning to struggle. The final 2 miles were chaotic in the rain as we were all bunched up; there were crashes in the final 2 turns, luckily I was out near the front and won the exhausting sprint for 2nd – 20 seconds behind the winner. Adam Perler continues his improvement toward competition in Track Masters National Championships. Representing Joey Keller, Adam proudly wears his Team Joey kit as a reminder of how fortunate we all are to have health, vitality, and a community of friendship and support. Adam posted 2 season bests during final event tune-ups with a 12.2 sec in the flying 200 (he was a 13.6 early in the year) and a 1:19 (improved from 1:34 early in the season) in the 1k. Adam is striving to break the 12-second barrier in the Flying 200. In order to do so, he’ll need to hit 40 mph. Hopefully the wind will cooperate. Adam reports, “I am just hopeful that I will be able to repeat these times when it really counts. The flying 200 and match sprint rounds will be on Friday. I believe I need to get in to the top 12 in my age group to advance to the sprint tournament. I will then do the 1k on Saturday. As you know, I am not an endurance guy… but that is turning out to be one of the areas I have improved the most in. Finally, I will be teaming up with two guys from the Speedway Wheelmen for a Team Sprint. I will be the lead off guy for the Sunday event. My goal is to bring the group up to 35mph from a standing start on the first lap and then peel off. This is harder than it seems. As it turns out, I have a “turbo lag” in my jump which starts out a little weak (probably from a slipped disc in my back) and then I hit my stride… unfortunately I have left my teammates behind a few times which is never a good things as my job is to go fast, but keep us together. The best part is that they have all agreed to wear Team Joey schwag during our event. If I have any chance of making the nationals podium, this will likely be the event. Either way… this season has been great. I will go out and have fun. I will be riding for my coach in the sky, Joey Keller, and dedicating my nationals to my cousin who will be having his 4th operation for a rare brain tumor as I pedal and navigate the velodrome… hopefully faster than I have ever gone before.” Best wishes for a fast and safe weekend, Adam! Southern Indiana and the Louisville area have never been hospitable to me as a bike racer. I’ve jokingly called the racers down there the Huns of Louisville in the past. It’s not that they are mean folks, but rather, they are as competitive a lot as you’ll find anywhere in the midwest. I enjoyed catching up with Eric Fagerburg, Mike McShane and Brad Swope prior to the racing. Yesterday’s event was a new venue, but the competition remained pretty much the same as it’s always been; fierce. As venues go, the promoters put on a great event. The course was secured by an excellent volunteer staff, podiums were ushered quickly after races were completed, and payouts were handled in a very timely manner. The course was not overly challenging, although it did feature as such: From the Start/Finish line racers tarverse approximately 200 yards to turn 1, a wide, sweeping left turn requring no speed let up. After turn 1, racers were greeted with a nice tail wind on the longest straight of the course that fed into a fairly wide turn 2 left hand bend, followed by a short straight into another left hander for Turn 3. Out of turn 3, racers were met with a stiff headwind, perhaps a fortunate blessing as it slowed us on a few occasions, before narrowing into a tight right hander at turn 4. From 4 we took a short straight to another tight left hander at Turn 5, then a very short straight to a left hander in Turn 6, at which point we opened the jets for the Finish line. The final laps were intense as riders jostled for position. Tolson and Micah Fritzinger of McDonald’s made the right move on the final lap, jumping into the headwind from Turn 3 to turn 4, with the former wrestler, Fritzinger, edging past the wiley veteran to take the win for McDonald’s down the stretch. The Masters 50+ lined up 10 minutes after the 40+ers finished. Perhaps 17 of us lined up for this one, with a handful having just completed the 40+ race. Being older, this group wasn’t as fast as the prior, but they were no less competitive. 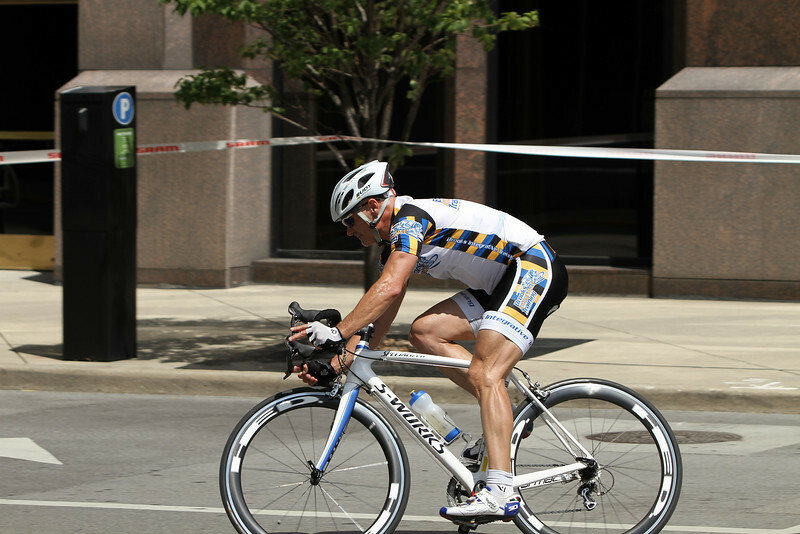 Brad Swope of Texas Roadhouse, a multi-time Masters National Champion, took the first attack hoping to soften the group. Upon his capture, I attacked hard for half a lap, but the group wasn’t giving me any leeway. After a couple laps of respite, Swope attacked again and I countered his move. Finally, other riders took short attacks, but no one managed to break free of the group until late in the race. 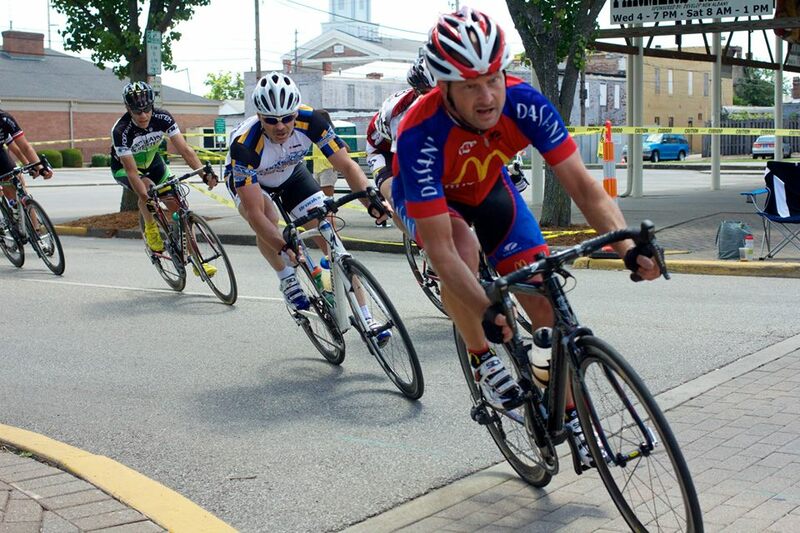 A Team Louisville rider broke clear, later followed by a McDonald’s rider, forming a 10-second gap on the group with 7 laps to go. With 5 laps to go Ft. Wayne Outfitters took up the chase, bringing it together at 3 to go. Swope and a McD’s racer took turns trying to snap the elastic of the field in the final 3 laps and seemed to have an effect as several riders tired over the final 3 laps. On the final lap Swope jumped from Turn 2 and held the lead through Turn 3 where the headwind stymied his move. Having witnessed Tolson and Fritzinger in the preceding race I had decided I would jump out of Turn 3 into the wind and take my chances on holding it to the line. My tactic worked and I took the win. John May of Papa John’s had been my nemesis early in the race, brining me back after my attacks. As such, he followed me on the final lap and took 2nd place. Post race was enjoyed in the company of Deb along with Sean O’Donnell of Columbus and his partner, Nita. Sean had not originally planned to race in New Albany, but upon waking to Nita’s urging to get out and enjoy such a beautiful day, the pair came down to enjoy the race. Sean is a lucky man. Best wishes to Adam at Masters National Track Nationals. Looking forward to the festive and competitive Mass. Ave. Crit. on August 10th. After Saturday’s rainy competition day I’ll begin this entry with another RAIN success. Having shed nearly 40 pounds in 2012 and spending the fall training with us at B.I.T., Henry Kim quietly selected a goal of finishing the RAIN ride this summer. 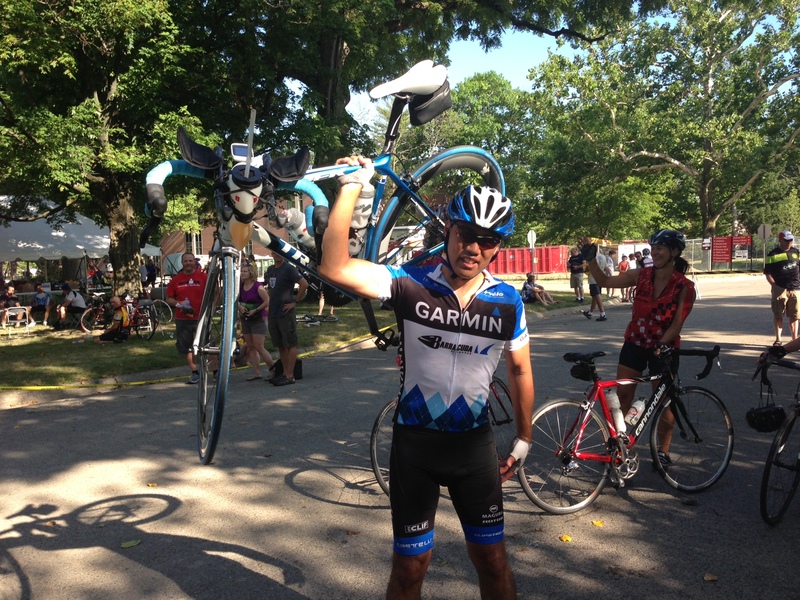 Henry reports that he kept up well for the first 60 miles with a pace of 20.6mph. As a doctor, Henry finds training time difficult to come by, especially for those long hour rides required to survive the 162 miles of RAIN. Nonetheless, Henry thought he was well prepared for every possible contingency except for the horrible momentum-robbing cramps he suffered in both thighs and calves about half way through RAIN. If it wasn’t for the kindness of another rider giving him electrolyte pills and a SAG worker providing “pickle juice”, Henry knows he would have been a DNF. Fortunately, Henry summoned the mental toughness so many of you exhibit and gamely completed the ride in a more than respectable 282nd place. Henry said the B.I.T. training helped him immeasurably. Well done, Henry! Angelia acknowledged that her running days are behind her such that she did walk a lot to complete the event, but she hopes she can resume running in small doses from time to time. The exciting aspect for Angelia was that she had a great bike split and is really looking forward to focusing solely on the bike in B.I.T. training this winter. Way to find the resolve, Angelia! Deb DuBois is also making strides in her cycling. On Saturday the 20th Deb competed in the Eagle Creek Duathlon, running 2 miles, cycling 10 miles, and then finishing with a 5K run. 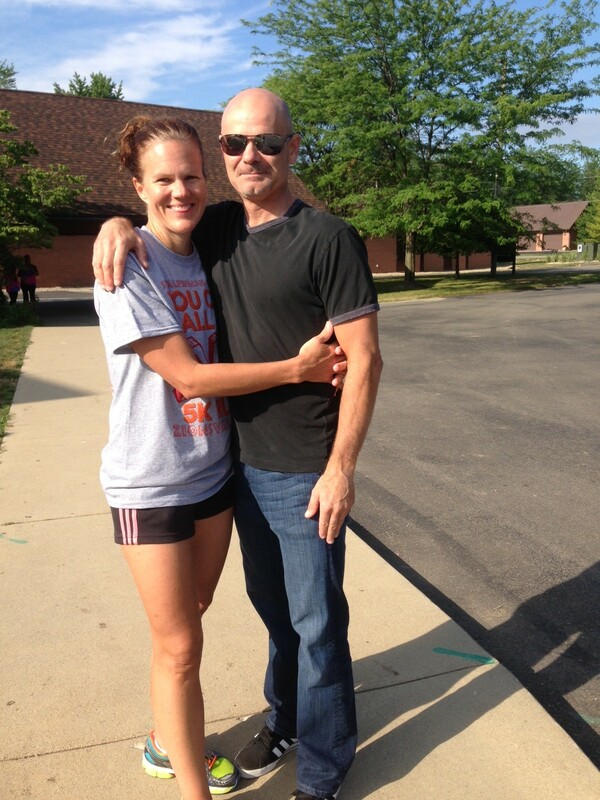 Deb finished 2nd overall in the female division and placed 1st in her age group. Deb said the Winter Training helped and that the Monday night rides have given her both a fitness boost and a confidence boost, allowing her to significantly improve her average speed on the bike leg compared to years past. Nice job, Deb! 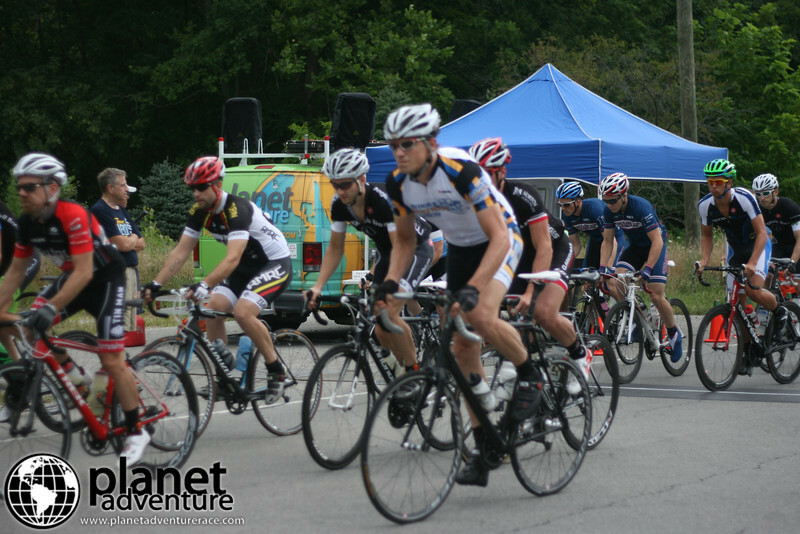 “There were 87 riders in the Cat 4/5 State Road Race. We did 4 laps of the 11.4 mile loop (45.6 miles). I rode my trainer regularly over the winter and in the month preceding the race I got in 1000 miles. However, in between those periods, there was quite a bit of time where I wasn’t riding regularly. Due to the uneven nature of my preparation, I was hoping to just be able to hang with these guys and get a field finish. (It should be noted Mark is in his mid 50s. Many of the 4/5s are young dudes). The race was fast right from the start. There were surges, you would have to jump out of the corners to close gaps, but the whole race would have been very familiar to many of you. It felt like being in a large Tuesday-Thursday B group in the “Hot Zone” north of 32, but for 2 hours instead of 40 minutes. Everything went well until we were 5 miles from the finish line and going up the hill on the course for the final time. Several riders fell in front of me and to miss them I had to go off the road to the right. I didn’t fall. By the time I got safely back on the pavement a gap had opened that I couldn’t close. I ended up finishing 60th in a race where the lead group averaged 24.8 mph. As Mark noted, the course was an 11.4 mile loop that featured one slight hill at the 6 mile mark, two slight rollers at mile 6.75 and mile 8.2, and a final grade of a gradual 1-2% incline over the final two miles. In the Masters race the pace was fairly tame for the first of 5 laps (57 miles). On lap 2, Court Maple, winner of last week’s Indy Crit., attacked hard. Situated right on his wheel, I went with Court. Court’s effort opened a nice gap. Upon flicking his arm, I came through for my rotation. A 3rd rider had joined us and when I flicked my arm no one came through. I waited…… and waited…., and waited…., and then Court blew by. Stuck in no man’s land I made the incorrect decision to bridge back up to Court. By the time I got there (with unwilling-to-work-passenger still glued to my wheel), the pack was upon us with fresh legs to counter. Court being on phenomenal form this year was able to reload and go with the counter that included 4 other riders. I was on no such form. A few of us in the main bunch were willing to work at chasing the break. Jim Creamer, Chris Richter, John Schmitz and I took hard digs to keep the pace high enough for one last chance to bridge the gap. At the mile 6 hill Schmitz attacked on one side and I attacked on the other. Richter, Creamer and Joe Fox made the selection and we began a hard chase. Frustratingly close at just 5 seconds behind the break, our chase ran out of steam with the main pack having clawed its way back to us. No one in the large group made the effort to jump the gap, our pace slowed significantly, and the race was over. Those 5 remained away, claiming the spoils. Bryan Boggs eventually won the race with Court taking 2nd, but first in his age group of 35+. The race for crumbs was animated by Schmitz and I, trading attacks and often bridging to one another, only to have the pack swallow us up after each attempt. Also in the mix were Chris Richter, Darrin Lay and Joe Fox. Schmitz and Creamer made a last gasp jailbreak attempt on the final straight away, but the sit-in police nabbed them about 1 mile shy of the finish. Richter had a nice sprint to finish 2nd in the 35+ Category. Well done, Chris. Kudos to Schmitz for maintaining the race as a hard training ride rather than a sun dial stroll; which as Hans described it, was exactly what the Cat. 3 racers did. Apparently, the 3s held social time, chatting and joking over 67 miles and then sprinted for home in the final mile. 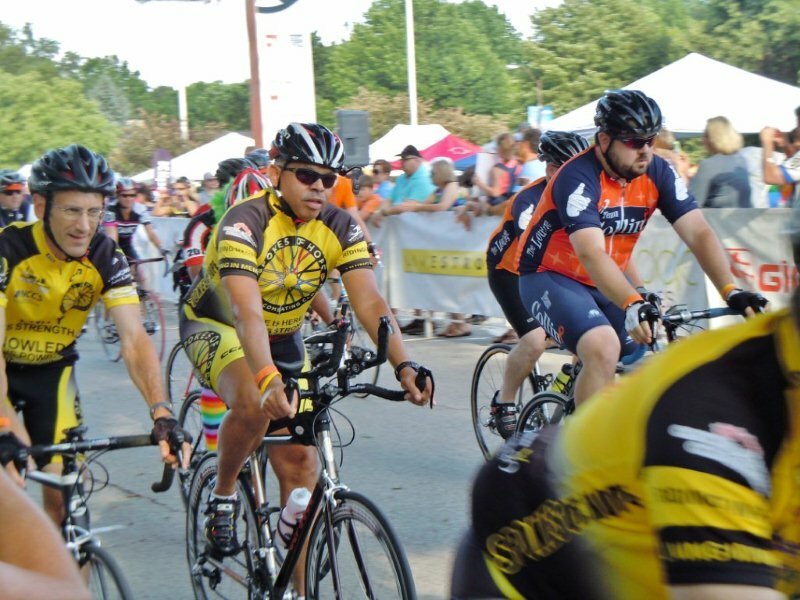 Several races loom on the horizon, including the Winfield Criterium Weekend, located just outside Chicago, the Bloomington Gran Prix, and the New Albany Criterium. This coming Saturday also features the Senior Games Cycling Competition in Cleveland. To all competing this weekend, ride well and stay healthy. Brooks Integrative Training athletes were everywhere over the past weekend; Adam Perler raced on the velodrome Friday night followed by a slew of riders active on Saturday and Sunday. 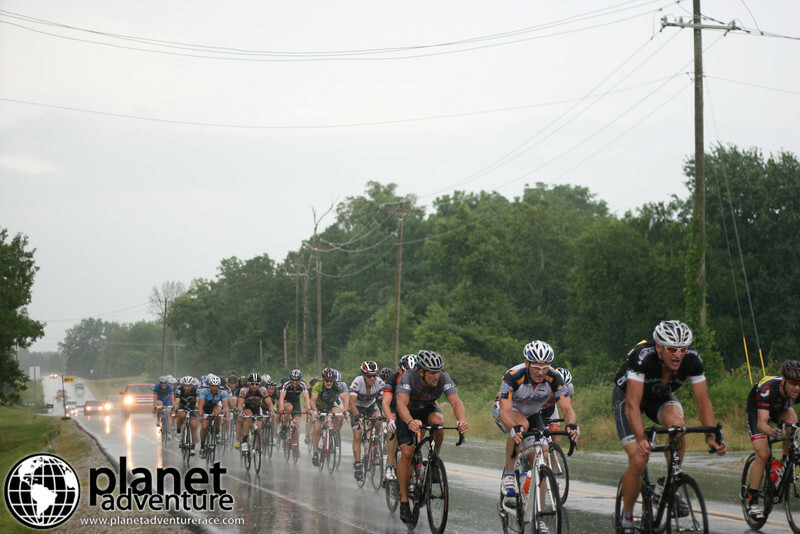 The Annual Ride Across Indiana (RAIN) left Terre Haute at 6 a.m. Saturday, traversing the central part of the state to Richmond. The gradual uphill grind was made more relentless with a 10 mph head wind. Josh Ginsburg led the B.I.T. athletes with a fine time of 7:46. Josh made it to mile 130 unscathed in the lead group. However, he burned a match or 3 at mile 115 when he took a stab at getting away, but the wind was too much to overcome. Although Josh missed his mile 130 food and fluid sag support he did not panic and was awarded for his patience when a fellow SAG supporter provided him with a bottle of fluid and a draft back into the main bunch. Once back in the main group, surges came and went. At about 153, the pack made another surge up what was essentially the last incline. With a mixed tempo, they punched the final portion at 21 mph and Josh paid for that mile 115 Match Burning episode by being popped from the lead group. Josh acknowledges it was a lesson learned, having been sent to the spank bank, and one he will remedy next year. Defiant to the end, Josh made sure to sprint home at the front of the 2nd group. It should be noted Josh travels all over the place and rarely has a full week at home to train. Josh mixes running and riding with his hectic travel to maintain enough fitness to complete something as arduous as the RAIN. Well done, Josh! Phelgar Washington and Ken Green also rode the RAIN, completing the ride in 9:20. I have no summary from either of them, but I can guess that Kenny, known affectionately as Second Half Green, likely came alive and took monster pulls from Greenfield to Richmond, and probably was the leadout man for Sprinting Machine Washington. 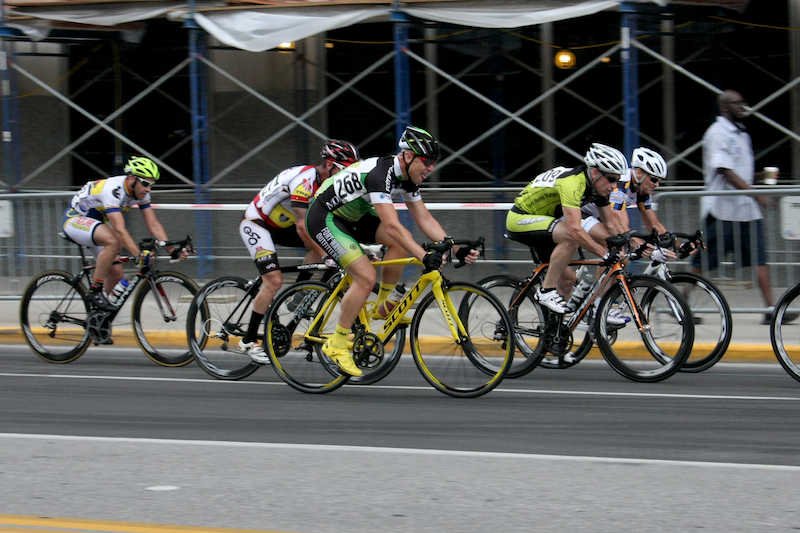 Andy Wagoner volunteered his time for the Indy Crit serving as a ride leader for the 38 mile CIBA ride before the racing began Saturday morning. Others volunteering for the Indy Crit included Robin and Anthony Barr, Ashley Koss and Preston Conrad, all serving as course marshalls during the day’s early events. 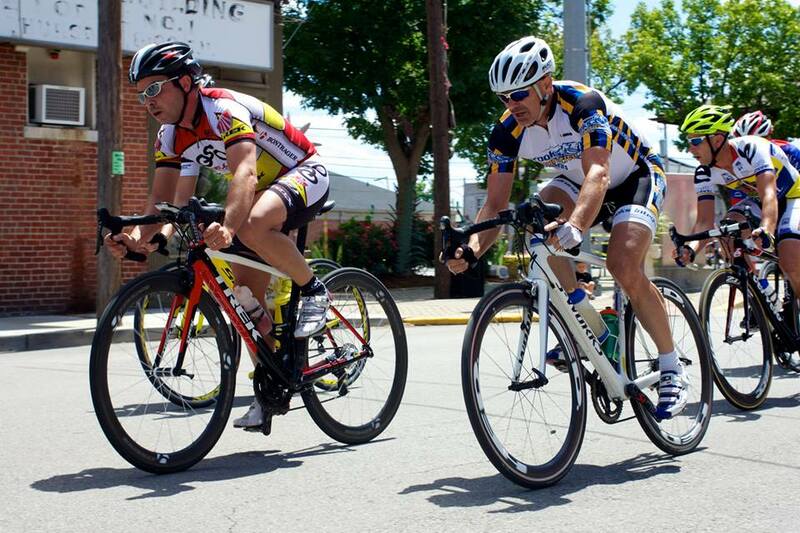 After a hot day in the sun on Saturday, Preston went up to Kokomo for the Colavita Time Trial Sunday Morning. Preston completed the 12.21 mile course in 29:11 for an average speed of over 25 mph and finished 4th in the 60+ age group. Nice work, Preston! 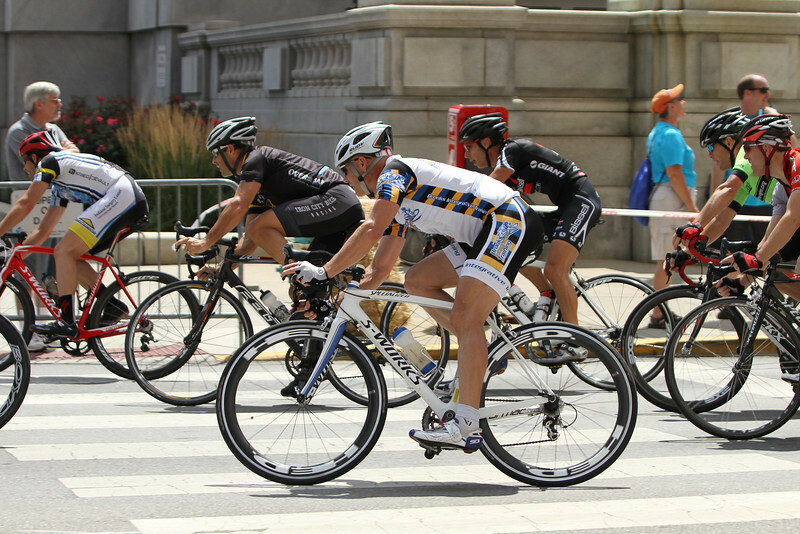 In its fourth year, Indy Crit is one of two premier downtown races. This year featured live music, BMX free style performances, strider bike racing, yoga instruction, and plenty of vendors, cycling and non-cycling alike, including the all important Beer Garden by Sun King Brewery. In addition to the usual category races, the event also featured celebrity races, kids races, and a tandem race. Yngvar and his wife, Kris, placed 3rd in the Tandem race. My participation included competing in the Masters 40+ race, along with at least 68 other old men in lycra. 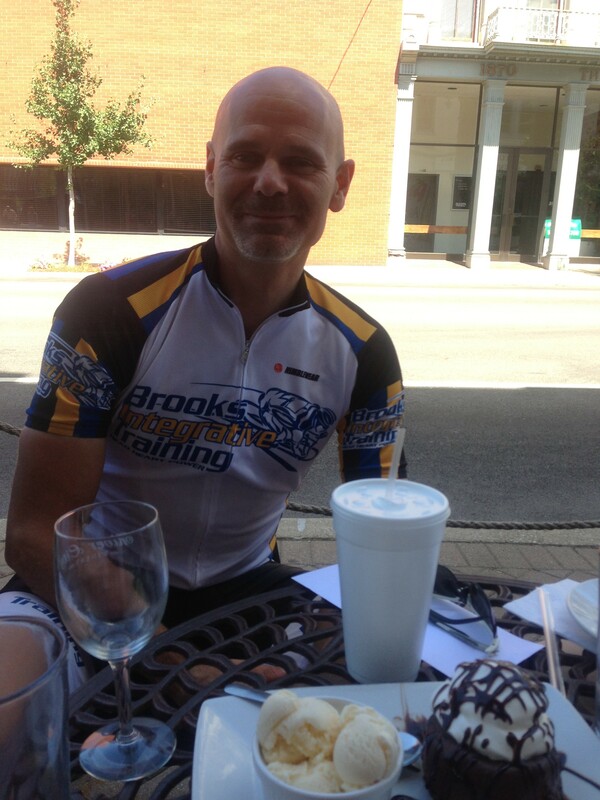 I was joined by my teammate and friend, Hans Ibold of Bloomington. Hans has trained with me for two winters now and although he does not race much, he is quite strong. Also among the competitors was Jim Creamer, friend of B.I.T. As is my wont, I think about races in the days leading up to the event. Of the 69 pre-registered racers I made a list of 10 or so guys I thought had a chance to win, with a few riders holding a greater percentage to win than others on my list. Curtis Tolson and Ben Weaver have each won a number of races this year and both featured on my top line. My outsider to crack the top line was Court Maple of MOB Squad. As a young man Court joined a US amateur team and raced in Belgium one summer, placing high enough in several races to provoke at least one pro team to offer him a contract. Court chose to come home, start his career and family and never looked back. His experience however, speaks volumes to his abilities. I saw Court dominate the Ft. Wayne race in May, prompting me to place him on my top line. 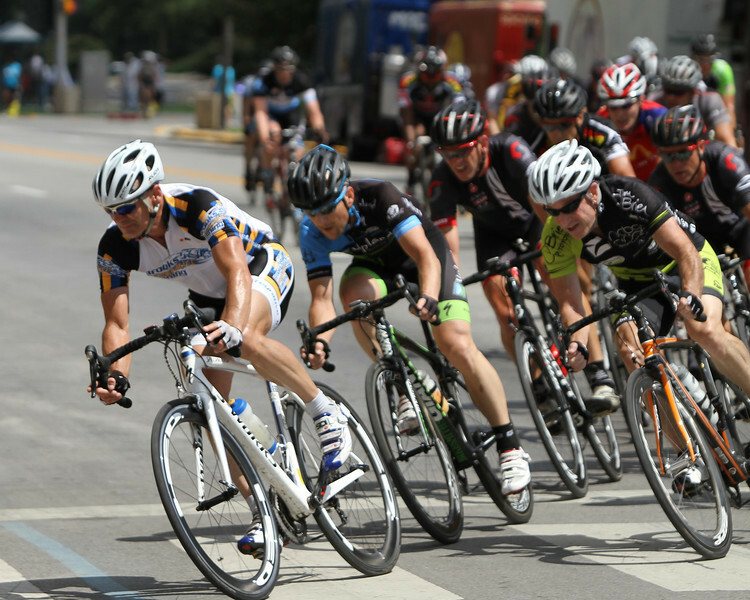 The course features 8 turns, although none of them tight enough to cause selection as is the case on more technical criterium courses such as Bloomington Grand Prix. As such, speeds were high from the get go. Rider after rider took flyers off the front. As early as lap 3 I followed a rider’s move and then continued for perhaps half a lap at warped speed at which point I looked under my arm to see a long line of frothing-at-the-mouth riders ready to attack so I wisely eased off the gas. Unfortunately, the wide course lends itself to swells and reshuffles when the pace slightly slows and I found myself too far back in the pack. A lap or two after my unwise excursion a group of 10 (most of whom were on my list) or so formed off the front and were rapidly pulling away. Finding room on the outside of turn 3 I moved up into position and by turn 4 I was full gas bridging to the fleeing group. This was the hardest part of the race for me. After half a lap I latched onto the group. But the peloton wasn’t quite finished yet and managed to claw its way back into contention another lap or two later. Court Maple and Bryan Boggs launched attacks through the middle portion of the race while Weaver, Tolson and others kept a vigilant eye on the proceedings, making sure nothing escaped without them. And then at the 30 minute mark the pack slowed. Fatigue set in as riders reached for bottles and others slumped over handlebars in a collective sigh of relief. In that moment of respite, Court Maple attacked and no one responded. Court quickly grabbed a 20 second advantage which he maintained for the final 15 minutes of the race. Digging deep into his vast reservoir (dare I say suitcase?) of talent and experience, Maple fought through the initial leg burn into the zone, where the big gears churned almost effortlessly with each passing lap. Riders on my second tier of contenders came to the fore, carrying the action over the final 15 minutes, but none truly working together to form a concerted chase effort. With 4 laps to go I found myself in 4th wheel, a safe spot so late in the race. With three laps to go Hans came forward and took a flyer with two other riders, putting the onus on others to chase, keeping the speed high through two laps to go. At 1.5 laps to go there was a crash back in the pack. You never want to hear a crash, but when you do, it gives you a jolt of fear-drenched adrenaline and those up front raise the speed several notches. Among those near the front at the start of the final lap were Tolson and Weaver. Sweeping through turns at over 30 mph, 8 or 10 of us seperated from the group as we headed into the final stretch of the course. Weaver kicked early with Tolson in tow and those two closed to the line in that order, taking 2nd and 3rd behind Maple’s phenomenal solo effort. I crossed the line in 7th, happy to place in the top 10 and glad I was not caught up in any crashes. Hans made a fantastic recovery after his late flyer by recovering to finish in 13th place. Jim Creamer finished in the top 20 as well. Jim informed me after the race that we averaged 26.8 mph. I initially doubted him, but he shared his data and it was spot on. My doubts were further alleviated on Sunday when my quads verified the effort. Although the next event scheduled was the Great Egyptian Omnium, circumstances mandate that I stay home, so it’s on to the State RR in Fishers this weekend, followed by more criterium racing the following weekend. If I don’t see you at the races, remember we have Monday Night Recovery Rides. These are SOCIAL and not hammerfests. The ONLY racing is to be first to the cooler of beer after the ride. B.I.T. riders continue to inspire; with their dedication, their service, and their character. Fred Evans, Tim Wozniak and Adam Perler rode/supported the 24 Hours of Booty fund raiser for IU Simon Cancer Center on Friday June 29. 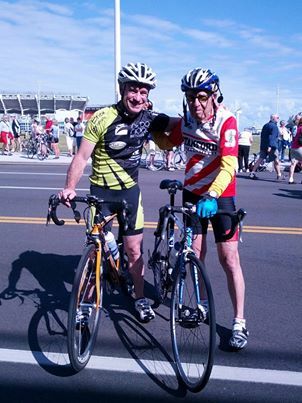 Fred and Tim rode with the Spokes of Hope team (Cindi & Ken Hart). The ride started a little after the posted 7 pm time on Friday evening with the threat of storms in the air. 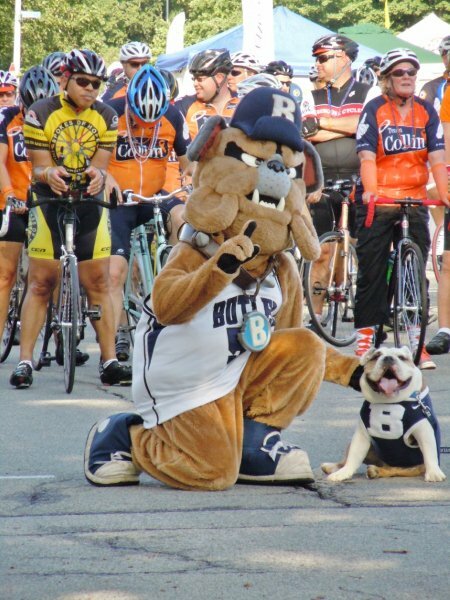 Held on the campus of Butler University, Mayor Ballard welcomed riders and supporters, joining the ride early on. An Indianapolis Police Department car lead the first lap, followed by an Indy Race Car on lap 2. Survivors carried the lead on lap three, making for nice pageantry. The course went through a part of the Butler-Tarkington neighborhood with many of the streets blocked off on the 3 mile, slightly hilly course. Fred felt nostalgic, riding through his neighborhood. Lawn parties of cheering neighbors encouraged and inspired the riders. The evening started out well with warm, but humid weather until about 8:30 pm when gusting winds and a following thunderstorm rolled through the Butler campus. Riders restarted about 10:30 pm with Tim W. continuing until about 2:30 am, at which point he went home for a four hour nap. Tim said grinding through the loop in the wee hours of the morning was a chore, but following Coach Bob’s advice about changing cadences and using the “big gears” for the climbs provided some diversion, but also helped keep the impending fatigue at bay. Tim said, “It was a fun 24 hours despite four lengthy thunderstorm delays (one on Friday night and three throughout the day on Saturday). The Hart’s “upped the fun” by having different ride themes throughout the event, providing costumes to complete the themes: pirates, Hawaiian and Mardi gras. By 7:30 a.m. Tim was back at it for the camp-wide breakfast and having fun with the themed rides on the 3 mile circuit – The Hope for Spokes apparel brought cheers from the spectators around the course. The Harts also held a midnight vigil at the start/finish line to honor those who’ve succumbed to cancer in the past year – including Joey Keller (of Team Joey – kit by Adam Perler who dropped by after his night of racing at the velodrome). Tim rode with a goal of completing 74 laps; 65 for his brother-in-law who died from cancer in early June at age 65 and 9 laps for Joey Keller). Rain prevented Tim from reaching his goal, but he got close – 70 laps for a total of 245 miles and satisfaction of supporting a good cause, riding with great folks and raising monies for a renowned local institution that helps those dealing with cancer. Fred carried on into Sunday, joining and sponsoring the Bike It 4 Prostate Cancer ride. Fred was joined by friend of B.I.T., Chris Richter of Motion Cycles. Motion sponsored the event and Chris led the 50-mile group. As mentioned above, Adam participated in round II of his track racing adventure. Seeded 5th heading into the round, Adam was slated to race the #8 seed; higher seeds typically defeat the lower seeds. Unfortunately for Adam, because the original # 8 could not participate, track personnel pulled from a pool of wait listed riders and the rider inserted as Adam’s opponent is a former Masters National Champion. This is akin to seeding Duke or North Carolina as a #16 in the NCAA Tournament. Adam exemplified true B.I.T. character when his opponent blew out his rear tire before their scheduled race. Adam suggested to his opponent that perhaps the opponent could borrow a wheel from Ken Hart. Adam could have remained silent and won by default – but we all know Adam is above that. With years of track racing experience and one of the most explosive jumps in Indy, Adam’s opponent won handily. Nonetheless, Adam garnered praise and exposure for Team Joey via his chivalry and character. Well done, Adam!